Mt Gox presents an interesting view into the world of Bitcoin. Here is a company that helped raise Bitcoin to where it is today, the CEO was on the board of directors of the Bitcoin Foundation, and Mt Gox is a “Gold” level contributor to the foundation. Why then was it that of all organizations did Mt Gox blame their woes on transaction malleability, when they were likely informed of the the issue existing back in 2011. I think to some extent they didn’t think of it as that big of a problem, or were not impacted by it. But this is not the issue I want to raise. Instead, I want to talk about venture capital investment in bitcoin. There is some concern of the capital being invested in bitcoin that they think of Bitcoin as a polished and finished project where they have the sort of support of a well paid development team. Mt Gox perhaps felt this way too, based on their reaction to a long known problem. One of my favorite Latin quotes is caveat emptor, buyer beware. By all indications, Mt Gox contributed a non trivial cash flow to the development team, they just didn’t head the warnings the development team gave them. Oh well, they won’t do that again. But what about the influx of capital into the Bitcoin ecology? I am not confident that they see funding development as important. It’s called the free rider problem. There are consequences for not participating, developers are not cheap. They have many opportunities available to them, what incentive do they face to put their creative effort into something without being paid? What level of support will a venture capital start up get if it doesn’t pay for the service and assume somebody else will foot the bill for development? I assume that not listening to advice given is equivalent to not getting advice period. Information not acted upon is information not at hand. 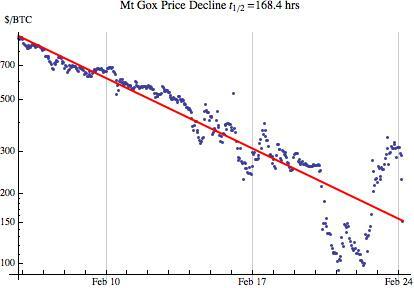 Let’s look at Mt Gox. If I were a VC, and I saw my capital having the potential half life of a week, I would take great pause. Burning the cash would be more effective. So what can I do to be comfortable with my investment? Well, I could pay someone for their advice. But who is an expert on Bitcoin. There is this foundation, but they just develop the code. Let’s pretend for a moment that the Bitcoin Foundation does a little more than develop code for free. We’ll imagine that they take a fee. That fee is structured so that it provides a service, software support, and some surplus. Since the foundation is a non-profit they have to donate a significant portion of their revenue in lieu of payments to shareholders. Their payment can be a payment in kind of funding their developers time in maintaining the source code. Not at all. Constraints matter. Bitcoin is an open source project. because of this access to the network is non-rivalrous. This means that anyone can provide the support and development service, even as a for profit enterprise. If they forked the development and forked the block chain, they would loose access to the rest of the ecosystem. If somebody provided a better service there is no coercive force saying they must use the Bitcoin Foundation or any other entity. Software support is a service and is an insurance policy against service interruption. Let’s treat it as such. Oh and by the way it can be used as a means of aiding the code development. So Mt. Gox collapse is not the issue you want to raise? Deceptive title then. Let the buyer beware? Not sure how, what I wrote about is decriptive. In retrospect, after revelations of Magical Tux’s use of depositor funds to escalate the price of BTC and manipulate the exchange, this post is a little naive. However, the concept of paying for software support is not new and can help to alleviate some of the risk that investors in open source projects (not just Bitcoin) face.